Many Texans spent a long day at the Capitol to offer thoughtful and powerful testimony on the seven bill addressing medical cannabis, including our priority legislation HB 1365 authored by Rep Eddie Lucio III. The Subcommittee heard from pain specialists, Rice&rsquo;s Baker Institute, Republican Liberty Caucus of Texas, Republicans Against Marijuana Prohibition, and more &ndash; all in support of medical freedom for Texas patients. Patients and caregivers passionately shared their personal experiences. Ask your Representative to coauthor HB 1365 today! 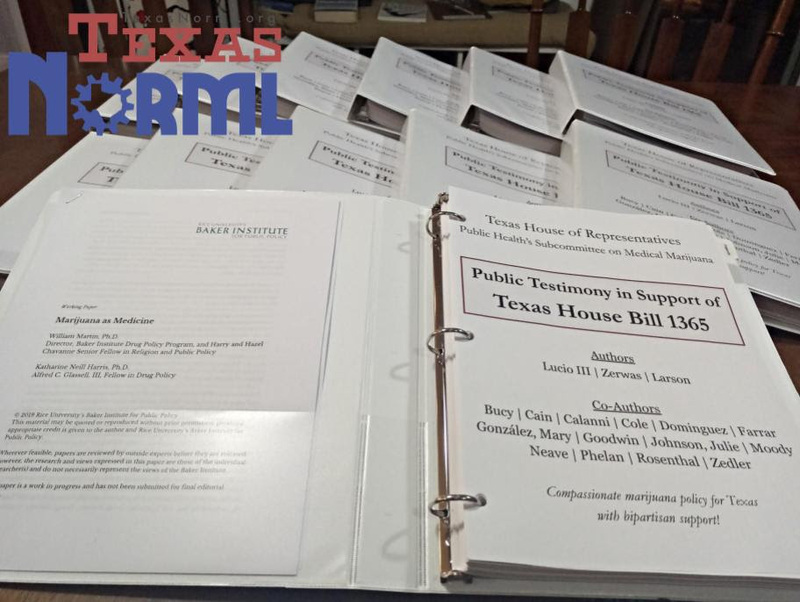 Texas NORML Executive Director, Jax Finkel, submitted the testimony of over a hundred of our fellow Texans to the members of the Subcommittee. It was our honor to bring the voices of those that could not attend into the hearing room. Make a donation to support our work at the legislature! Right now, we have strong bipartisan support for reform in the Texas Legislature and a record setting number of bills have been introduced for consideration. There&rsquo;s a very small window to make this happen before the session ends in May. It will take all of us doing this important work to get across the finish line! Now that the Medical Marijuana Subcommittee has heard HB 1365, what happens next?In the Texas Legislature, committees tend to leave bills pending after the hearing. They will typically vote on bills in batches. This means that it can take about 2 weeks for a bill to be voted on, though this can vary. This means that we can expect a vote on HB 1365 in the near future. Once the committee votes, they will issue a report on the bill that will be distributed to every member in the chamber. When HB 1365 progresses, it will be sent to Committee on Calendars to be place on the floor calendar. Learn more about the process. Representative Eddie Lucio III has expressed the need for Texans to reach out the their Representatives and ask them to support HB 1365. Ask your Representative to coauthor HB 1365 today! This will help continue to solidify the strong bipartisan support as the bill progresses. You can also reach out to your Senator to support the medical cannabis, SB 90, would eliminate the arrest, jail time, and criminal record associated with low-level marijuana possession. Stay tuned! We will keep you updated on the progress of the bill and any additional actions that may need to be taken. Please consider making a donation to our legislative crowd funding campaign.View pictures from the hearing.Marijuana policy should be evidence based. Help dispel the myths with NORML&rsquo;s Fact Sheets! For more information follow Texas NORML on Facebook, Twitter, and visit their website!